COTABATO CITY — A malfunctioned engine brought down a crop duster in Ampatuan, Maguindanao Saturday morning. A report from the office of Senior Supt. Ronald Briones, Maguindanao police provincial director, said the pilot, identified as Capt. Dennis Pandi, survived the crash. “The chemical sprayer plane was a total wreck’” Briones said. Responding employees and plantation workers of Amardi Banana Corporation rushed Pandi to a hospital in nearby Shariff Aguak town following the incident. The injured pilot works for Davao Airworks, a firm providing chemical spraying services to agricultural plantations across Mindanao. 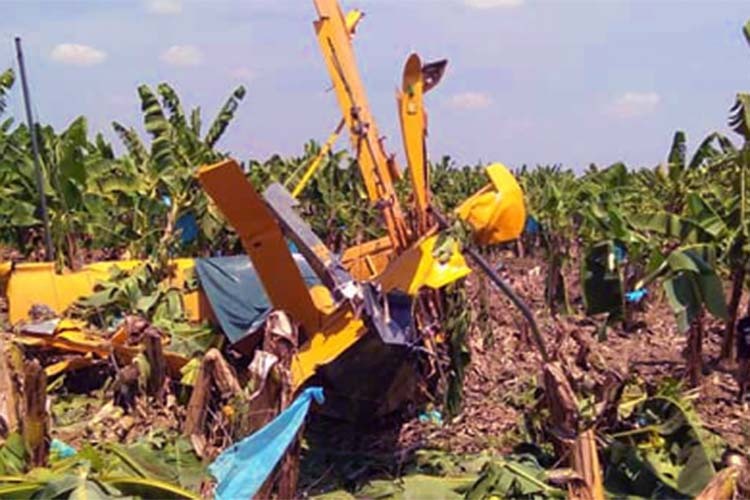 Robert Mauricio of Amardi firm said the aircraft experienced engine malfunction while spraying over the banana plantation in Ampatuan town, forcing its pilot to find an open space for emergency landing. He said the plane hit rows of banana trees before it crashed landed at past 9 a.m.